Who doesn’t love emoji? They allow us to express ourselves digitally in ways that we would never be able to with just words. You can express everything from, “I’m feeling sick and going to the hospital,” to “My cat pooped a palm tree, one hundred!” and everything in between. While most devices support both the enjoyment and typing of emoji right out of the box, some may require a few more steps before you’re informing all your friends that “construction worker tsunami soccer ball,” whether they like it or not! The first step to getting emoji on your phone is to see if it has native support for them. It’s easy enough to tell — one of the simplest ways is to type “emoji,” into Google, and look at the search results. If the page is dotted with little squares instead of smiley faces and tiny airplanes, you’ll want to continue to the next steps. If you can already see all the emoji in their full colorful glory, you can skip down to the Turn on the keyboard step to enable them in your keyboards. Then, you can send them to your friends and plaster them all over social media. Depending on the model of phone and version of Android you have, emoji support may be built into your device already, and all you have to do is turn it on in your settings. Under the global Android settings, there is a menu titled, Language and input, which will contain the options for different keyboards and languages throughout your device’s operating system. 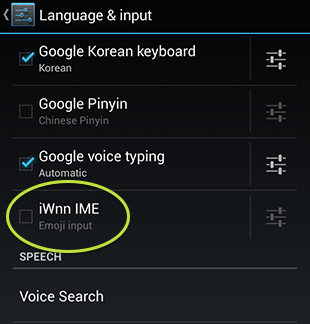 Newer Android devices will have the option to enable a keyboard labeled iWnn IME, that will immediately allow you to access the emoji keyboard across all supported apps and basically any program that doesn’t use its own custom keyboard. However you got emoji working properly on your phone, you’ll still have to enable a keyboard that supports them before you can pester your friends by no longer using words in text messages. There are a number of options available, but if you’re using Android 4.4 or newer, the standard Google Keyboard may be just the trick. It has native support for emoji, which can be accessed by typing their defining word into the keyboard, where they will appear as autocorrect suggestions. If your phone didn’t come with a setting or tool to enable emoji use, you’ll have to check out to the Google Play Store to find one. Third-party keyboards like Swiftkey, Minuum, and Swype support emoji use when typing and sending messages, as well as edit text fields in any program that doesn’t have its own keyboard. Since you have to give the developer access to everything you type into the keyboard, it’s a good idea to stick with one of the well known keyboards with good reviews on the Google Play Store. Most of them have emoji support, so which one you use comes down to personal preference.